This is a self guided and self paced tour of the ancient wine caves that are found under the streets of the city. You can set out for an afternoon and enter this stretch of caves where there is stored a huge collection of local and traditional wine varieties. You walk along on your own comparing each bottle. At the end you have a self tasting session while you are enlightened with more info about these caves by a staff member. The wines are not very good here in taste. You will not find any toilets or washrooms here. How popular is Patriarche Pere & Fils? People normally club together La Moutarderie Fallot and The Cook's Atelier while planning their visit to Patriarche Pere & Fils. Tour at your own pace thru the cellar. Taste the whites and the reds near to the end of the tour. Clean and ample bathrooms. Buy the wines you like when you finish tasting. Good shop too! If you are in Beaune this is one of the must visit spots to see while you are there. The tour is totally worth your while. 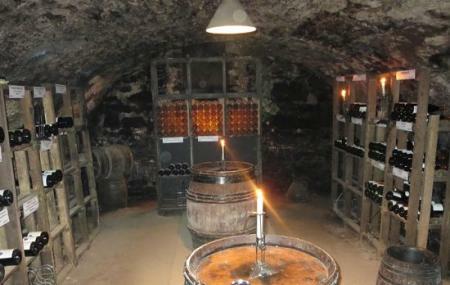 There is an incredible length of wine cellars that run underneath the town. In the cellars there are wines from throughout history. There are batches from certain vintages and there are walls with collections that run vertically through time. Towards the end there is a nice shop area with a wide selection of Patriarche wines to choose from. I would go back in a heartbeat!!! One of our best days in France was when we drove down from Dijon to explore the Burgundy wine region. The Patriarche Winery tour was very interesting, took us down in the cellars, and the actual wine tasting was better than you get at most wineries. Highly recommended! Beautiful cellar, 10 different tasting wines were ok, nothing impressive. The big downside is lack of info. It is a self walking tour. Although they have 5km of underground cellar, you can only walk 450 meters. 17 euros is on the expensive side. Kids can enjoy the cellar for free.